E-Movers is an ISO 9001:2008 certified company, offering professional local and international relocation, furniture installations and storage services. E-Movers is the largest home and office relocation company born in the UAE. It was established in 2003 by a team of professionals with the vision to usher excellence in the hitherto disorganized and chaotic relocation services in Dubai. Over the last decade E-Movers has served with distinction individual as well as large organizations helping them to move homes and offices with ease and efficiency. It has time and again proved that moving can be a ‘No Mess No Stress’ experience if done right. E-Movers opened their first international office in Qatar in 2011 after having expanded to Sharjah, and Abu Dhabi in the earlier years. The opening of the first international office reflects the growing economic prominence of Doha in the middle-east region and an acknowledgement of opportunities breeding in Qatar. E-Movers built its business with a single-minded focus to relieve customers from the tension and stress of moving. The company plans each move meticulously and has a time-tested process that is diligently followed by its experienced and trained crew under the supervision of a project supervisor. Each move is a shared responsibility with the customer to ensure that the move is carried out quickly and with minimum disruption. Meeting deadlines and sticking to schedule is possible because of our large pool of manpower and fleet of trucks. We take pride in the loyal list of customers that we have served over the decade. Our customers include individuals, families, private enterprises, government institutions and international aid agencies. The unflinching trust of our existing customers contribute 70% of our annual business making as perhaps the moving company with the highest fidelity index. We strive to exceed customer expectations, and each day we inspire our team to stay true to our motto – No Mess. No Stress. 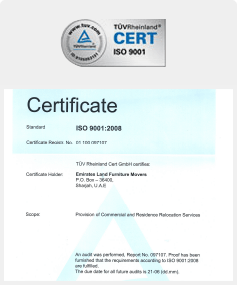 We are a certified ISO 9001:2008 company that is periodically validated by audits. E-Movers is committed to quality and process to achieve customer satisfaction. Test processes to identify gaps and upgrade them to fix it. E-Movers is also a very prominent and active member of the International Association of Movers and represents the UAE moving industry at each of the annual conferences held across the globe.